My Country Soap is made with a blend of healthy oils for the skin. Each oil adds a quality to the soap; olive oil adds a wonderful humectant and is the base oil. The soap also contains coconut oil, sweet almond oil and may contain hemp oil and grape seed oil. Homegrown organic herbs and vegetables along with pure essential oils complete each handcrafted bar. 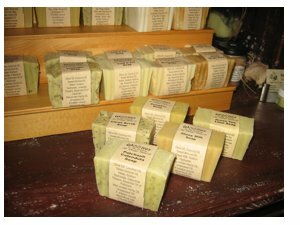 I make all of my soap in our farmhouse using the cold-process method. I live on a hobby farm south of Owen Sound with my husband and four children. We raise and grow most of what we eat organically / naturally. I believe in a live off the land mentality and through that belief "Woolies In The Country" was born.